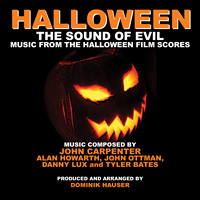 BuySoundtrax Records is proud to scare the bejeezus out of you this fall with the release of HALLOWEEN: THE SOUND OF EVIL – MUSIC FROM THE HALLOWEEN FILM SCORES, available digitally on October 2, 2013. The collection is the first to celebrate the music from the eight films in the original series and the two films in the re-imagined series and includes music by John Carpenter, Alan Howarth, John Ottman, Danny Lux, and Tyler Bates. The album is arranged and produced by Dominik Hauser. Filmmaker John Carpenter created not only the slasher film that reinvented the genre, but the music that would define terror for decades to come. “The piercing tonality of his shrill synth sustains took on the gleaming sheen of a butcher knife’s blade, while the electronic stabs of lower-end synth chords became the brutal blows of the killer’s slashing arm and the repetitive, tinkling piano notes became the spine-chilling icicles dripping down your spine,” describes Randall D. Larson, author of Musique Fantastique: 100 Years of Science Fiction, Fantasy & Horror Film Music in the liner notes.